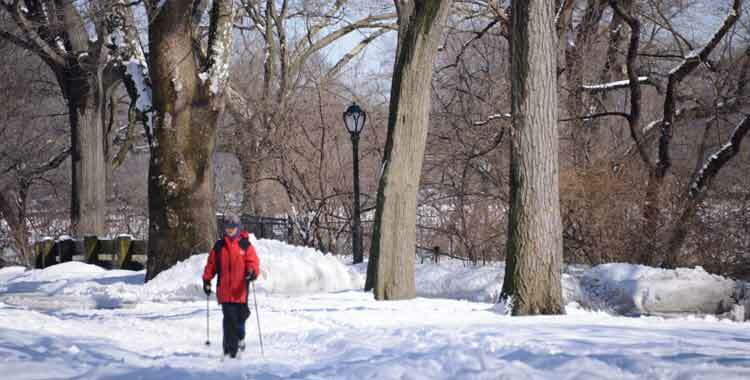 Central Park is a wonderful venue for cross-country skiing. There are many areas where enthusiasts can enjoy beautiful scenery while feeling the swoosh and glide of the snow under their skis and the bite of the crisp cold air against their faces. The best places to ski are Sheep Meadow, the Great Lawn, and other large meadows in Central Park. Cross-country skiing is allowed when there is at least six inches of snow cover on the ground and conditions permit.